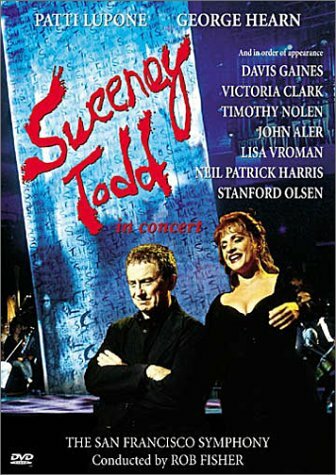 Here are a couple of numbers from the San Francisco Symphony Orchestra’s 2001 concert production of Stephen Sondheim’s Sweeney Todd. It starred Patti LuPone as Mrs. Lovett who four years later starred in a Broadway revival of the show and was nominated for a Tony Award. What is especially great about the concert version is that it also featured a pre-How I Met Your Mother Neil Patrick Harris who in the first video, sweetly sings Not While I’m Around to LuPone’s Mrs. Lovett. He’s so damned talented as is the fabulous LuPone who in the second video performs The Worst Pies in London. I got to see this show live in the Chicago area when they brought it through town. All members involved were amazing, but what blew me away the most was the singing performance from NPH. “Not while I’m around” is not a light song and he nailed it. My friend and I got to shake hands with him and LuPone after the show.